The painting After the Chase (canvas, 63 x 80 cm, signed lower left) was for a very long time only known to the public through a written entry in the catalogue raisonné on the paintings by Philips Wouwerman by Hofstede de Groot in 1908 (no. 712). Most probable in French private collections since the 19th century, no image of this work was published as well. On 24th June 2011 the picture was sold for € 280.000 (plus buyer's premium) by Piasa in the Hotel Drouot Richelieu in Paris. 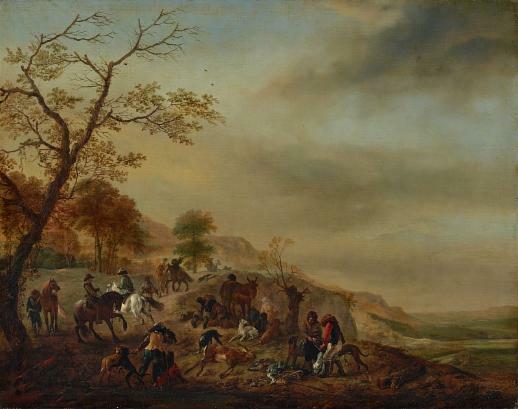 After the Chase belongs to the early hunting scenes by the Haarlem master and can be dated around 1647/1648. The very light yellowish varnish doesn't affect the very good condition of the work, which, regarding the broad variety of landscape and staffage details, is a very good example of Wouwerman's mastership even in his early period.